Scott Mathison knows that he has to get his footing right, or he will land on the rocks 60ft (18.2m) below. He runs, jumps and flings his legs and head back, trying to hit the exact spot in the sea off Plymouth Hoe where he knows he will be safe. A split second later and Scott, 15, is laughing with friend Dan as a group of French student girls admire his daring. 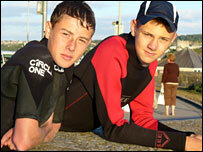 For the two friends, "tombstoning" is an every day activity - but one which has just sparked a new safety warning. Seeing Scott's flight into the sea brings to mind the divers of Acapulco in Mexico, with their breathtaking descents from the cliff-tops into the crystal clear seas. However, there is nothing as glamorous as the cliffs of Acapulco about Plymouth Hoe. 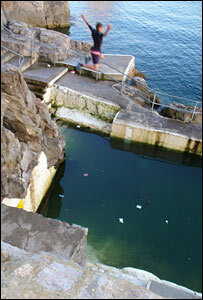 The "cliffs" are the concrete balustrades lining the promenade and the "clear seas" are often the long-forgotten tidal swimming pools, built years ago and since neglected. Inside one pool, dubbed the Leander by tombstoners, a green mass of seaweed obscures the bottom, but a depth gauge on the side shows that it is just 6ft (1.8m) deep. The rocks from which the pool is created jut out into the middle of the pool. Yet on any day in the summer youngsters can be seen risking their lives in the drop. The Corinthian, next to the yacht club which it gets its name from, is a 90ft (27.4m) drop with a fearsome reputation. In June, a teenager was injured after jumping off the Corinthian which demands an exact jumping arc between rocks on either side. To Scott, who has escaped with only a few bruises and cuts, the risk of serious injury only adds to the thrill. "The adrenaline rush is amazing," he said. "If there was no risk there would be no point." The "rush" is such that he wants to jump over and over again. It is not until his mother Kathleen appears to take him home that he stops. She says she is aware of the risks, but feels powerless to deter him. "He'd come down here whatever I told him," she said. "You've got to live and learn, and anyway we used to do it ourselves." In Devon and Cornwall, where the craze is growing among locals, and luring holidaymakers too, coastguards and sea rescue services now reckon they are called out to help at least one jumper a week. Last year a man in his 20s died after jumping off cliffs at Ansteys' Cove at Torquay. "Tombstoning is a nickname, it's a descriptive word, and it's quite apt, because you can die doing this," says Fred Caygill of the Maritime and Coastguard Agency. "There are inherent risks with jumping into water. You don't know the depth, you don't know what obstructions are underneath, and you can't be sure of your own capabilities." He said the tombstoners just get an extra kick out of being told to stop. "Local people have been jumping into water for years," said Mr Caygill. "If you talk to older people, they say 'Oh I did it when I was a kid and I was okay', but they were local and they knew the risks better, they knew the tides." "Now we've got a situation where people from other parts of the country and from abroad are coming to the coast on holiday and they see locals doing it and think it's okay. "The local people wander away because they know the tide is starting to go out, but the others carry on jumping." 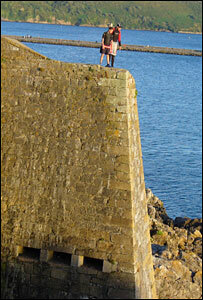 In Ilfracombe, in north Devon, tombstoners jump from a harbour wall. "You feel excited and scared. It's frightening and the adrenaline rush is great. It makes me feel happy," said 13-year-old Christi Kelly. "In the summer, we come down here most days after school. It's fun, and it's free." Harbourmaster Rob Lawson said: "It's been a problem for decades, even generations," he says in an interview on the quayside. "They thrive on the aggravation it causes. "These kids' fathers and their fathers before them jumped off this harbour wall. It's in their genes."